Listening to the mainstream media too much is a dangerous thing. They’re masters of distraction and diversion, and they never tell you the full story. For instance, if you only read the corporate media headlines about cannabis, you might get the impression that the market is entirely limited to North America. As important as the United States and Canada are, there’s an equally important and potentially lucrative cannabis trade starting up in Europe. We’re talking about a massive region with over 742 million people – more than double the U.S. and Canada’s combined population of about 360 million people. And with a budget of $1.79 trillion, Europe’s government-subsidized healthcare systems are generally open to medical cannabis solutions to a wide range of health issues, from pain alleviation to anxiety reduction. Catering to the European marketplace and to the EU’s 1.6 million health-care practitioners is a smart move, but few companies have the resources or even the permission to penetrate this market. One company is making it happen – and making history too. 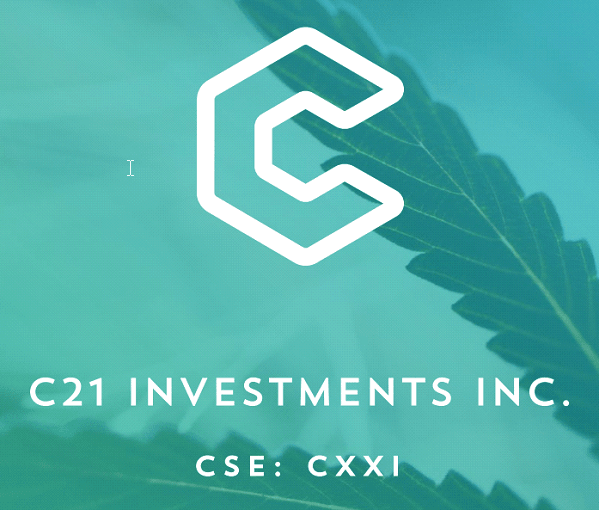 It’s a Vancouver-headquartered cannabis company called C21 Investments Inc. (CSE:CXXI), and they’ve become the first international entity to be granted a license to import and sell cannabis products in Ukraine. Ukraine, which has a large population of over 42 million people, is a major trading partner with the European Union that offers a long history in agriculture, a skilled labor pool, attractive wage rates, and preferential access to European markets. In 2014, Ukraine signed an agreement referred to as the Association Agreement, making trade with the European Union much easier; Ukraine’s trade with the EU has increased significantly as a result. The massive Ukrainian consumer base is now potentially open to C21 Investments Inc., as the State Service of Ukraine on Medicines and Drugs Control has officially granted permission to C21 to import, process, distribute and re-export CBD (cannabidiol) extracts, concentrates, and products. CBD extracts and products with minimal THC content are currently legal in multiple countries within the European Union. With this historic development, C21 will now have the ability to distribute and market its branded products across much of the EU, targeting a large portion of a market with an eager and cannabis-friendly consumer base. To this end, C21 has already opened a representative office in Kyiv, the capital of Ukraine, in order to oversee its operations as well as pursue other business development opportunities across Europe. It’s a smart and forward-looking move as policy changes and pro-cannabis sentiment spread throughout the European continent. To be sure, C21 Investments Inc. already has a firm footprint in North America with hundreds of dispensaries, hundreds of thousands of square feet of premium cannabis cultivation space, and a suite of already established, highly recognizable and popular brands. But it’s the brilliant move into the much bigger potential European market that’s putting C21 over the top and into the buy zone for smart investors. Don’t you dare wait for the mainstream media to jump on this one – jump on it first with a position in C21 Investments Inc., your first and best move into the fast-growing European cannabis market. This work is based on SEC filings, current events, interviews, corporate press releases and what we’ve learned as financial journalists. It may contain errors and you shouldn’t make any investment decision based solely on what you read here. It’s your money and your responsibility. Wallace Hill Partners LTD, a Canadian company, which is owned by the same individuals as Wealth Research Group LLC, has been compensated three hundred thousand u.s. dollars, five hundred thousand canadian dollars and one million, right hundred thousand RSUs, directly by c21 investments, for a three year marketing agreement. The information herein is not intended to be personal legal or investment advice and may not be appropriate or applicable for all readers. If personal advice is needed, the services of a qualified legal, investment or tax professional should be sought. MAD RUSH: This Just Turned TOTALLY SERIOUS! MASSIVE WEALTH: Sit Down For This ONE!